This attractively-priced portable media player is made by little-known Korean brand Iubi and sold in the UK by www.advancedmp3players.co.uk . But don't let its obscurity put you off - with a sensational spec sheet, we reckon it could be a real surprise package. For starters, there's a 60GB hard-disk drive inside, giving you plenty of room for video, audio and photo files. And there's no need to worry about whether your media will play or not, as the Iubi Blue supports every format under the sun. However, WMV 7/8, MOV and Real Video files have to be transcoded using the supplied software, which is a fairly time consuming process. The Iubi Blue can also claim to be the first Bluetooth-enabled PMP, which means you can listen to your tunes using wireless headphones. It also offers video recording from external sources using the built-in MPEG4 encoder and the AV inputs on the side of the unit, as well as MP3 voice recording using the built-in microphone. The 4.3in, 16:9 screen has a resolution of 480 x 272-pixels, plus there's a built-in speaker and battery life is around 8hrs for video and 14hrs for audio. The unit is comfortable to hold and the front-mounted controls are fairly intuitive, although it takes a while to suppress the instinct to press the 'M' button to select an option, rather than 'Play'. In the box is a headphone lead with attached control unit, which allows for hands-free playback. The onscreen displays are beautifully presented and clearly laid out, while the unit itself looks stylish and unpretentious - although the slightly plasticky casing means it lacks the rock-solid build quality of the Archos. But there are no qualms when it comes to performance. The LCD screen delivers excellent picture quality, with clean and sharp reproduction of video files. Using the DiVX trailer for The Da Vinci Code as an example, objects look deliciously sharp and remain visible even during the trailer's many darker scenes. With other clips, such as a recording of This Morning With Richard Not Judy in WMV format, the colour reproduction is superb and the image quality doesn't appear to suffer from the transcoding process. Audio quality is remarkably good too, with our MP3 and WMA test files sounding crisp and chunky, with lots of bass on offer. The built-in speaker is weedy though, so stick with headphones. Bluetooth functionality works well most of the time, and lets you wander up to 10m away from the unit, though the sound quality can get a bit crackly at times. 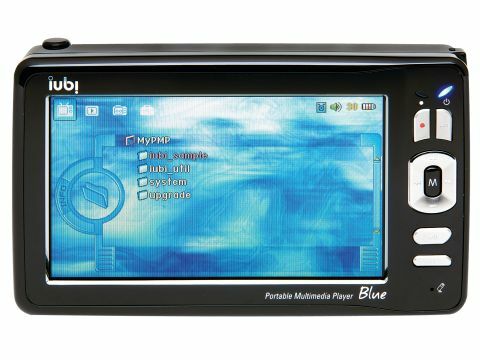 Overall, the Iubi Blue is a sensational PMP, combining a killer feature list with terrific performance, topped off by long battery life, excellent file compatibility, exceptional ease of use and a great price.